At any rate, I’m on her mailing list because of those purchases, and lately I’ve been seeing ads on Facebook as well for her new stacking rings. I’m always keeping my eye out for fun mementos for my in-laws that remind them of Jaime, and I knew my mother-in-law would love these rings. As I was checking out, I couldn’t resist buying a set for myself as well since the kids have somehow made my wedding rings disappear (oops) and I wanted something to wear on my ring finger again. They arrived yesterday, and I am SO in love with them! FYI – Lisa Leonard has no idea who I am – I just love her work and thought I’d share it here! OMG I LOVE those rings! 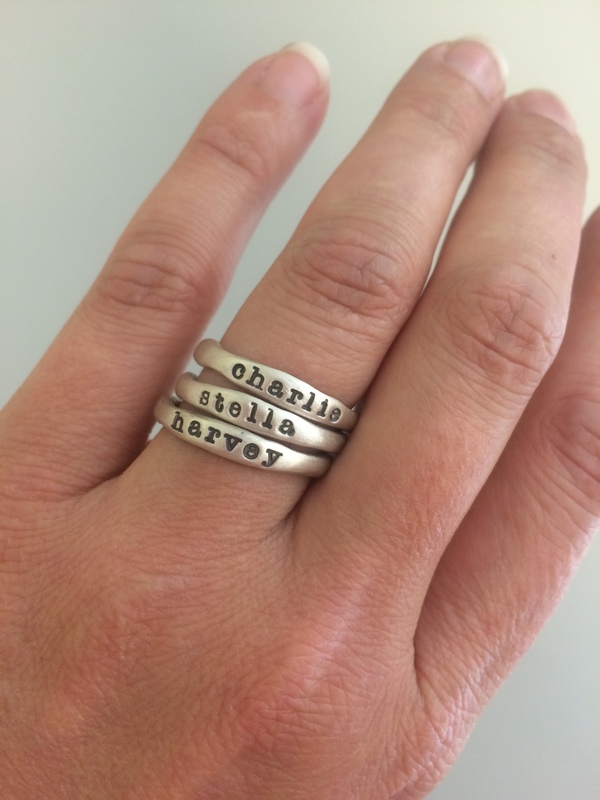 I don’t normally wear rings but these … I could do these! How thick are they? I have stumpy fingers soooo stacked rings look dumb on me. Sigh. I too LOVE those rings!!! I am also a huge tradition person, and love the idea of getting your kids special ornaments each year….I may have to start that too!! YES! I love those stacking rings and I have them on my list every year! BUT I’ve never thought of doing one with Brian’s name too. GREAT IDEA! I am going to check out her site right now! I love what you did for your MIL. How nice and special! She will love them! You’re a great DIL! 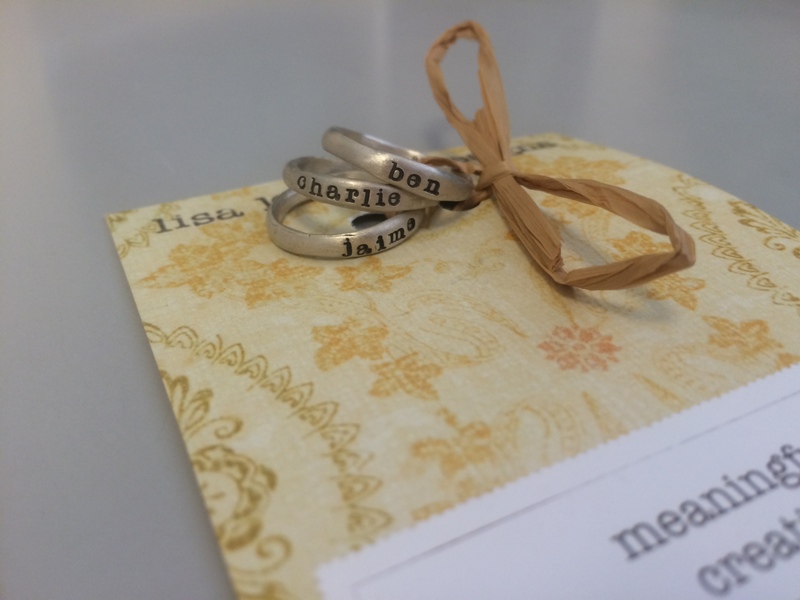 yeah – I like the look of 3 vs. 2, and at first I thought about putting a phrase or our last name or “love” or something, but then I decided it made sense to have Charlie be the 3rd! Oh – and I just bought them on a 20% off sale – definitely sign up for her email list to get the coupon codes, because she runs them all the time and that saved me a ton of money on this purchase! You are a very thoughtful daughter-in-law. Beautiful! Thank you for sharing! Will have a look at her website and most likely will order those! The rings are super cute. I’ve wanted necklace versions of something like this for a while. Very thoughtful to get some for your MIL. Ooh, I’m going to check out that site. I love the idea of a yearly ornament! these would go PERFECTLY with my initial necklace and certainly would help me during times like right now when I’m missing my babies to pieces….Thank you for sharing…let’s see if I can figure out a way to scrounge together enough to get myself a set. Sign up for the mailing list and order when she has a sale – I got them for 20% off and free shipping! I was just online now searching for this year’s custom ornaments for my girls after opening the Christmas box this afternoon and adoring theirs from the years so far. Love that tradition and so glad we have been doing it. And love those rings!!! I have a handstamped necklace with my girls names and my wedding anniversary and then my mum got me another similar one last year but everything down here gets sooo tarnished that it isn’t even worth trying anymore 😦 I guess from the salt air? I don’t know why it never happened in Nova Scotia living by the ocean though, but here it happens every single time and quickly. Boo. But anyway, love them! !